Our first order of business today is to update readers on the strong recent performance of SFOR; the stock has made a really nice move from its PPS following our most recent mention on 09/27 at .0083. Yesterday was SOAN’s first ever appearance in our newsletters, and for a maiden mention, it ended up doing pretty well for us, with a solid intraday push. The stock traded in a daily range from a low of .38 up to .50; a 32% run which occurred on volume which exceeded the monthly average by more than three times. It also closed at its high of day, a bullish occurrence which qualifies the stock for continued monitoring as a potential momentum play as we prepare to close out another trading week. Last Friday we signaled RT for both a potential bottom play and extended-term options call, and thus far it has panned out to a great idea in both respects. We called the bottom perfectly, seeing it trade as low as 2.08 that day, and inching its way up all week. Yesterday the stock reached a new high of 2.8599, marking a 37% move up. That push allowed our options idea, the RT 11/18 $2.50 Calls, to make a fantastic move from a low of .05 up to .30. That works out to an even 500% rip, so congratulations to anyone who caught our timely alert and used it to their great advantage! Fresh Options Idea: We want to draw attention to JP Morgan on the heels of their premarket earnings beat this morning, and assign an options trading idea to correspond accordingly. We’ll focus on the JPM Weekly $68-69.50 Calls for potential daytrades, but remember, trading weekly options on a Friday is a high-risk proposition that should only ever be attempted by expert traders. Additionally, please note that if the stock breaks the 69.50 barrier, we may need to roll up our strike price to the $70 Calls. JP Morgan Chase & Co. JPM - The first item on our agenda this morning is going to be to formulate an options trading idea for JP Morgan on the heels of the company’s earnings beat this morning, which has the stock gapping up here in the premarket. We’re going to be zeroing in on the JPM Weekly $63.50-65.50 Calls for potential daytrades, and/or swing trades into tomorrow, depending on how the activity unfolds. Seagate Technology Holdings, Inc. STX – STX has recently been making a nice move after a large gap-up earlier this week. 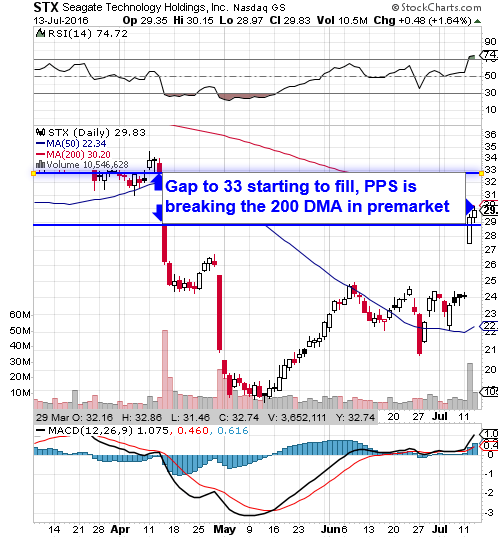 In the premarket it is pressing past the 200DMA(30.20) and looks as if it could continue to truck higher and fill the gap on the chart to $33. We have a couple corresponding options ideas that could be in line for some nice gains; for daytrading opportunities this week, the STX Weekly $30-31 Calls, and the STX 07/22 $30.50-31.50 Calls for potential swing trades into next week. Gold Resource Corp. GORO - We’ve been tracking GORO closely since we entered it into the conversation at the end of June. At the time we had observed a PPS low of 3.19, and yesterday the stock continued to push its upper limits with a new high of 5.50. That represents an overall swing of 72% and a new 52-week high as well. Firmly in blue sky breakout territory, we’ll continue to keep an eye on GORO. Lot78, Inc. LOTE – After tracking it to some nice gains last week, we saw LOTE pull back slightly yesterday, to a swing low of .016 before it rebounded 37% back to .022. We’ll look for the stock to retest our previously observed high of .03, the breaching of which would put this one into blue sky breakout mode as well!